Votes are still open for Colin’s Halloween costume, and will be for a couple more weeks. At the moment the toast costume is in the lead! Pauline’s a body heat leech. Hi I just found your comic a few days ago and spend the last two days reading the entire archives. I love you comic so much. It’s so cute. Also I do this to my friends all the time. I do this to my husband all the time. I do this to my boyfriend. Although I like to think of it as absorbing his warmths. like a heat sponge. I do this to my sister. And vice versa! I love warmth. I’m part of the cold half of the family. My mother and I are always stealing someone’s warmth. Aww, it’s still cute even if it is for evil purposes. Colin is so warm that he doesn’t mind. In fact, he thinks of it as her giving him some of her coolness. Cool!! 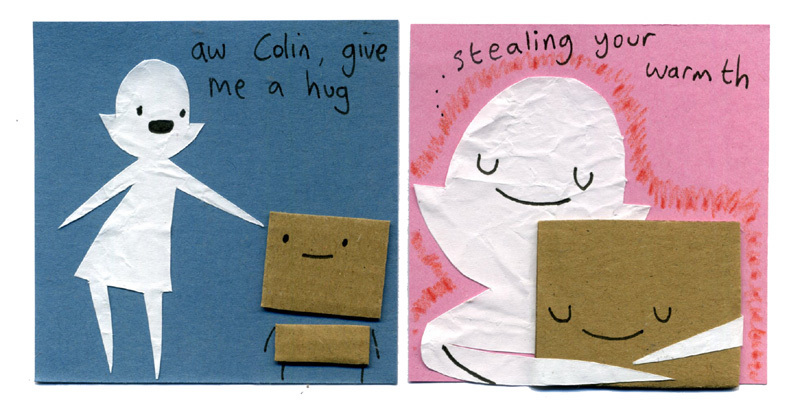 Colin’s like, a warm heat sponge! my cat does this. all this time, i thought she wanted to snuggle. turns out, she was just stealing body heat. That is sad. Bad kitty! Aww… I wanna snuggle too! Wait! You’re just stealing my warmth! You sneaky cat!